One of the things I love about blogging is the online friendships I have developed. One of those friendships is with Toni, also known as The Happy Housewife. I first started reading The Happy Housewife when I read about her coupon for the troops program on another site. I think that was almost three years ago. Since that time Toni and I have become friends and we even met in person last year at a blogging conference. Last week Toni posted about the lemon tree in her yard and how she was trying to find new ways to use lemons because she had so many. 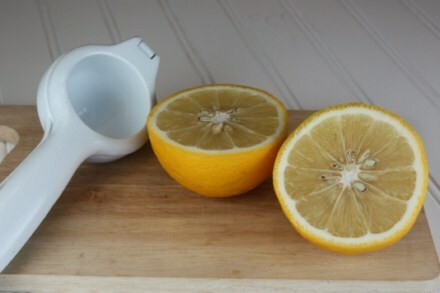 She even hosted a lemon link up and asked her readers to share their favorite lemon recipes. When Toni posted about her lemons and I saw the pictures of how many she had, I was a bit jealous. You see lemons are right up there with chocolate as one of my favorite foods. I love lemon pie, lemon pudding, lemon bars, lemon curd, and more. Really, I love anything lemon. I was teasing Toni about how jealous I was and how I wished I had a lemon tree in my yard like hers. Well, earlier this week I received a box from The Happy Housewife. My first thought was, no, she didn’t. But yes, yes she did, Toni sent me lemons, straight from her tree. And look at those lemons! I can not believe how good these lemons are. It is going to be hard to go back to regular store lemons again. 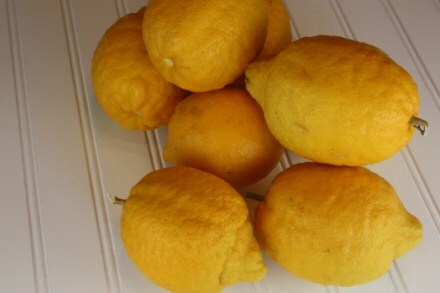 Not only were these lemons good, look how big they are. 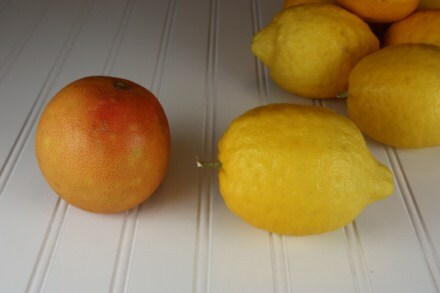 This is one of Toni’s lemons next to a grapefruit that I had in my refrigerator. The lemons were as big as a grapefruit and they were so juicy. Thank you Toni!!!! I love the lemons. I had seen how big those lemons were when she first posted about them. Wow! I’m sure you will be enjoying those! Love lemons and this is so nice that she sent them to you. Enjoy! Hi! I also like Happy Housewife a lot. She introduced me to the frugal community and now I’m addicted to save money and cook! Lemons are so good and healthy and those that you have are so juicy and good! I use them a lot in my teas. What an awesome package to get in the mail – yum!! !